Ask my family, every time I hear a recording of that speech, I turn to mush. Why? Because “all” means all. Young, old, middle aged, those with physical limitations and everyone in between. Ten years of experience taking my child to Disneyland (once to Walt Disney World) has given me a perspective I can’t wait to share. In fact, I love it when I find out that others are able to take advantage of my experience. Our recent trip was an introduction to the new Disabilities Assistance System. Although I don’t own a plaid vest, I’m happy to be your tour guide to this magical place. Planning is our first stop to making your trip successful. It starts with being able to articulate your loved one’s needs and desires as well as limitations. In our case, the crowded line gets frustrating for Allison. Imagine sitting in a small wheelchair in a crowd of people where you can only see backsides and thighs. It takes a very short time for a meltdown to occur so avoiding that saves our day. We have specific times where Allison needs to have her g-tube hooked up. This means any attraction we use at the time has to be one that accommodates her chair. We plan transfer rides around her meals. We factor in heat issues, toileting times and even schedule in quieter moments. Knowing these things makes it easier to express our needs so the Cast Members (employees) can help with accommodations. Plan on getting to the park early to stand in line at the gate. Once you get in, depending on what park you choose to start with, go straight to City Hall at Disneyland Park or Chamber of Commerce in Disney’s California Adventure Park. Your whole party will need to be with you for this process so they can count heads. They will list the number of your party on the front of the pass so you can stay together. This is an improvement from before because the previous limit was six – this time they included all 12 of us, two being in wheelchairs. Among the days we went, we found the line at California Adventure’s Chamber of Commerce had a much shorter line. That may not always be the case, but it worked nicely for us. Let me give you a tip that will not only help with everything: Always be polite. Always speak kindly. Even when you have to be firm, being abusive or demanding isn’t a right any of us have earned. When approaching the Cast Member, go as a learner. 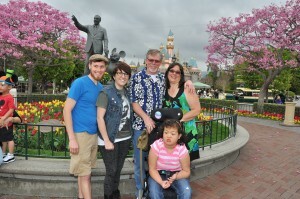 “What can I do to make my daughter’s day at Disneyland special?” That is their goal too, after all. You will be given a small booklet with a photo of the passholder on the front. Inside there are lines to fill in for the attractions you’ll want to visit. They’ll use the current wait times (how long the current line is) to determine when you should arrive. Sometimes you’ll go straight there, other times you’ll be able to fit in something else along the way. This is where the planning comes in. There are strategically placed kiosks all over the parks where you can check in for the next attraction. It helps to have a couple of choices in mind so the Cast Member can help you plan your next moves. In extreme cases they will offer a small amount of “readmission passes.” They are given case by case and are meant to meet very specific needs. You will have a small brochure that tells you where every kiosk is located. Every single one was convenient. It isn’t a perfect system and one size does not fit all, but from first hand experience I will tell you, Disney has thought this through and are still willing to take feedback to improve. Familiarize yourself with the park you’ll be in that day. Get a map and locate First Aid. We use First Aid for toileting needs. The bathrooms are large, private and come with cots for tending to incontinence issues. We are more familiar with the one in Disneyland Park at the end of Main Street to the right. California Adventure has one set a little further back in the park. They will also offer you pads to change on and trash bags for your use. In the warmer weather they offer places to cool off but we choose cooler attractions at those times. It’s a Small World, Pirates of the Caribbean and The Enchanted Tiki Room are our top cool down spots. At the entrance of the Tiki Room there is a Dole Whip stand to buy a treat that is so good it has a cult following. It even has wait times posted. Disney has worked very hard to give every guest a wonderful experience. It even shows in their food preparation.